Tyler spent his teens touring the VFW’s and basements of America playing guitar in punk rock bands. After graduating from college, Tyler moved to NYC where he played music, worked at record labels, and managed bands. Tyler’s business and legal career in music began with the representation of artists, including the Ramones.Prior to Gimme Radio, Tyler was a Business Development lead in the Internet Software and Services division at Apple Inc. where he developed the mobile carrier distribution strategy for the newly launched Apple Music. Prior to Apple, Tyler was an SVP and General Counsel at Beats Music LLC, and part of the team that designed and launched the Beats Music. Tyler was a member of the team that sold Beats Music to Apple Inc. in August of 2014.As the SVP and General Counsel for MOG Inc., a start-up on-demand music subscription service, Tyler worked with the head of product to develop a novel and much-lauded freemium model. He was a key driver in the sale of MOG to Beats Electronics in 2012. Before entering the world of digital media, Tyler was an attorney in New York City, spending three years at Jenkens Gilchrist Parker Chapin LLP and one year at Troutman Sanders LLP. As a lawyer, Tyler represented and advised clients in connection with complex commercial litigation, intellectual property, and entertainment law matters, and represented a number of artists. David has worked in digital music since 2006, serving in both legal and business capacities for numerous leading digital music streaming services. including Live365, Rhapsody, Beats Music, and Apple. Prior to Gimme Radio, David served as the Head of Distribution Partnerships for Google Play for the Americas and APAC, managing a global team of Business Development leads tasked with growing Google’s digital music service worldwide. David also led the legal and economic battles of the 2010-2015 Copyright Royalty Board rate setting procedure to establish the royalty rates for the music industry, which resulted in establishing a fair royalty rate for webcasters. David has been heavily involved in the acquisitions of Napster and Sonora Music on behalf of Rhapsody, and worked with Tyler on the $3B acquisition of Beats Music by Apple.Prior to his work as in-house counsel, David worked at the law firm of Townsend and Townsend and Crew as an associate in its tech transactions licensing group and as a patent litigator. He is a member of both the California State Bar and the USPTO, and holds a patent in digital music entitled “Digital File Processing for Secondary Sale” (US 9,311,633). Jon has been at the forefront of creating compelling consumer digital media experiences for over 20 years. After starting in print media as a reporter, editor, and publisher, Jon led the Bay Guardian’s first moves to digital in the early days of the internet by launching both the paper’s web site and a thriving community site.Jon spent years writing about music for various publications and was able to merge his interest in the music industry and technology at Red Herring Magazine, where he covered the early days of digital music startups. He ended up working at one of the companies he covered, the streaming service Rhapsody.After managing the company’s content programming efforts, Jon later headed up Rhapsody’s product management practice. He oversaw the transition from primarily a desktop tethered service to a mobile-based one. Immediately prior to Gimme Radio, Jon was VP of Product for 8tracks, a user playlist music site. Andy started his career early at Frog Design - a design firm in the US where he focused on mobile interface design. Over his 12 years of working in the Bay Area at firms like Frog, Punchcut, and Odopod, Andy built his practice around designing multi-device scalable systems and building large go-to-market digital products for brands like Microsoft, Disney, Intel, Samsung, eBay, CNN, Google, Motorola, Skype, Toyota, Timex, and T-Mobile.Andy conceived a process and design approach that bridges the boundaries of brand, digital, and physical. He has proven this process not only for large clients but also with his own brick and mortar business, Black Sands - a brewery and restaurant in San Francisco. Andy designed and built the entire physical and digital experience which includes food products, brewing supplies, and a beer brand that is growing in popularity.His 360-degree design approach and focus on user experience are unique and valuable to modern brands that have both digital and physical touchpoints. Andy’s approach and process create highly effective and insightful design systems. $500 – Gimme Radio Investor Patch. $1,000 – All the above plus Gimme Radio T-Shirt. $5,000 – All the above plus a 6-month membership to the Gimme Brigade (gives full access to our archives of over 2,500 hours of metal programming, 15% off in our store, a personalized Gimme patch, and an exclusive Gimme Brigade T-shirt) and special digital badge indicating investor status on Gimme Radio. $10,000 – All the above, but a year-long membership month to the Gimme Brigade (instead of 6 months), plus a “thank you” on our social channels. $20,000– All the above, plus the chance to DJ your own “listener” show on Gimme Radio. $50,000– All the above, plus a choice of signed guitar from Ben Weinman of Dillinger Escape Plan, a signed bass from Jessica Pimentel of Orange Is The New Black, or a signed Bass from Rob “Blasko” Nicholson, the bass player for Ozzy Osbourne. 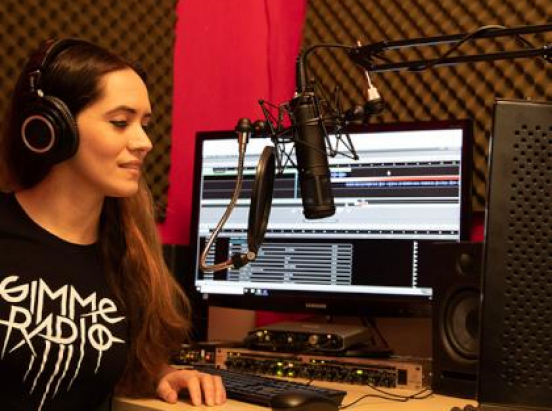 $100,000– A Gimme Radio T-Shirt, 1-year membership to the Gimme Brigade, a “thank you” on our social channels, a chance to DJ your own show on Gimme Radio, PLUS a guitar signed by Dave Mustaine of Megadeth.